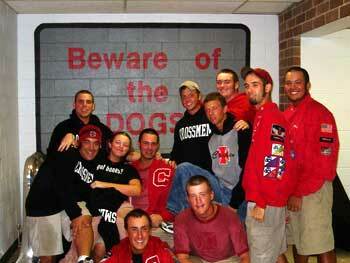 Jesse Pitzer, a Crossmen contra player in '04 and '05, sent in this one. "This is a picture of the Crossmen Contra line. It was taken at a show in St. Peters, Mo., on July 11. The show actually got rained out and we ended up doing a standstill performance in our street clothes. When we were getting shelter from the rain we saw this sign that is in the background and had to get a picture of it because our nickname in the corps is the dogs." Thanks Jesse! E-mail your best shots from the summer to dave@dci.org along with where and when the photo was taken. Send some biographical information about yourself as well. We'll give you full credit. Also, let us know if you want your e-mail address included.